So as I said in my previous review I do have 3 others that were just so good I have to review them even though they were not selected by the shops for my weekly reviews. The first one we have, came to us from Bearded Browncoat (Mainly because Diamond shorted Vibranium this week….damn you Diamond get on the ball!)! Anyway, the first one of these comics is The Superior Octopus! This is a lead up to the big Spidergeddon event that they have coming up like ASAP. So Superior Octopus sees a revived Doc Ock swinging into the hero business in the West Coast of the US, more specifically in San Francisco. Doc Ock is running around with a Spiderman-like suit That is a mix of the Iron Spider, Doc Ock Arms, Spidey Stealth Suit and maybe a pinch of Spidey from his Fantastic Foundation days all rolled into one. One thing I find interesting is that Ock doesn’t seem to have web shooters like a lot of the spider peoples but instead has Ink Shooters that he uses to blind his enemies. Doc Ock also now goes by the name Elliot Tolliver. It seems that when he died to save a woman he loved (a woman of small stature which kinda shocks me…she must be extremely smart for someone as superior as him to have fallen for her) Anyway when he died to save her his body consciousness found itself in a clone that mixed Peter Parkers DNA with his own. We saw Doc Ock side with the Secret Empire and the Hydra Cap so that he could try to retake Parker Industries. Now he has fled to San Fransico where he is trying to do the hero thing again. At the beginning of the comic, he has a throw down with the Night Shift who he recruits away from a life of crime to become his eyes and ears in the city. He later has a run in with Arnim Zola who wants him back in Hydra and isn’t willing to take no for an answer. Ock kills Zola after he kills a clone of the Gorgon that first kills Ock. I know lots of killing and cloning. But Ock now knows how to clone and come right back which he does to surprise and kill Gorgon before killing Zola but opening things so that Zola’s consciousness can escape to another body. 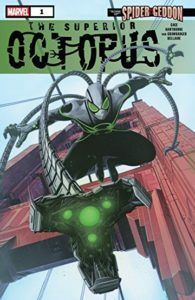 We find out that Ock stole the Cloning tech from the inheritors from the Spider-Verse Storyline which was in turn stolen from the Jackal and made better by the inheritors and supposedly perfected by Octavius. The big thing here though is that this starts giving out a signal that the Inheritors might be able to piggyback to clone themselves again but this time on Earth 616! To me, this was a great lead-in comic and I like the fact that the pompous Superior Octopus who thinks he’s infallible is most likely the one that will end up causing all the problems because of his hubris! Have you read this one yet? If so what are your thoughts about it? If you have not read this one yet do you think it is one you would be interested in and why?